There are many reasons why a person might decide to begin a blog. For some people, blogging is an avenue though which they can promote their business venture or their creative work. In addition, blogging can be therapeutic for individuals who wish to impart advice gleaned from their personal experiences or for individuals who may be seeking advice in an anonymous, non-threatening environment. I started Sundry Folly (in its current incarnation) in June 2014, after hosting its far inferior predecessor through Tumblr for just under a year. Admittedly, I do blog for some of the reasons listed above, however the primary impetus for blogging really began with a promise that I made to my mother in March of last year. A year ago today, my mother passed away from complications of breast cancer. She was only 63 years old. Mom was an intelligent, funny, and talented woman. Yet, like many of us, she carried regrets and ‘what ifs’ around inside of her. Mom’s regrets and disappointments are her own and it is not for me to discuss them here. However, who hasn’t looked back on his or her life and wondered, “What would my life have been like if I had only tried that? What have my fears cost me?” Mom wanted her children to live in a way that would bring them the least amount of regret. She didn’t want us to be passive about life. In fact, during a rather emotionally charged mother-daughter phone conversation that I had with her in 2013, she told me exactly that. I am not disappointed in you, but I want you to be less passive. At the time, I didn’t want to hear her maternal counsel. I was 31 years old–old enough to figure life out for myself, right? Now, when I reflect back on that conversation, I realize just how much I had needed to hear her advice. Throughout my life, I have had a strong tendency to not take a stand when being treated unfairly. I have let toxic friendships and relationships continue way past their expiration dates because I was afraid of being alone. From a very early age, I allowed others to devalue me. Naturally, it pained my mother to see me being treated like a doormat. My family tells me that I had a tremendous amount of pluck and self-confidence in my early childhood, but that those traits vanished when I reached the first grade–this was the time when I started being bullied by my fellow classmates. The bullying was usually not physical in nature, although I can remember a few times when classmates pushed me and threw things at me. The bullies in question primarily used verbal insults to beat me down. I remember being called ugly and stupid more times than I can count and those were just the PG rated insults. This kind of verbal harassment continued for the next seven years. If I told teachers or staff about the bullying, the persecutor would make life even worse for me because I had gotten him or her in trouble. I didn’t have any coping strategies. I was an outmuscled, wispy kid. I was also a pacifist. I didn’t want to fight back. I merely wanted the other kids to start being nicer. By the time high school rolled around, my classmates had matured (somewhat) and no longer garnered much joy from taunting me, but it didn’t matter, because my confidence had already been destroyed. I walked around in a shell that echoed with all of the jabs and jeers which had passed through my ears during those seven soul stealing years, but now the put-downs were being doled out in my own voice. I had managed to internalize everything that my tormentors had laid upon me. In high school I joined choir and the theatre club, but never had what it took to land a leading role. My shy nature and lack of confidence in auditions relegated me to being in the background. I began my undergraduate career as a vocal performance major but switched majors after only a year and a half in the program because of severe performance anxiety. In the aforementioned cases, it was usually not a lack of skill or talent that barred me from achievement, it was the fear of being judged. In my head, more often than not, I was still telling myself you can’t instead of you can. But, let’s get real and stop the pity party. The misery that was middle school happened over 15 years ago and I can’t use it as an excuse for non-action anymore. Even though it is not always easy, I am slowly learning how to not listen to the mocking pre-pubescent voices of yesteryear. There is power in learning how to let go and in creating boundaries that other people cannot cross. That is what my mother so desperately wanted and perhaps needed for me to understand. For far too many years, I let myself be silenced, at first by other people and then–more dangerously–by myself. During the time that mom was in hospice, I promised her that I would be happy and that I would stop being passive. When one of her children was going through a rough patch, mom would sometimes say, “A mother can only ever be as happy as her unhappiest child.” It was important for me to let mom know that she didn’t need to worry about me anymore. And so, this blog is a way for me to partially fulfill my promise to her. Through blogging, I can share my voice with others. Is everything that I write a gem? Of course not! Are the photographs that I post Pulitzer Prize worthy? No, they are not. But their presence inside of me and on Sundry Folly are helping me slowly crack the shell which I have been hiding under for so long. The accompanying picture is of some of the many candles that I have lit for my mother over the last year. I hope that I can shine in ways that would make her proud. She is greatly missed. On October 9th, it was announced that French author Patrick Modiano will be the recipient of the 2014 Nobel Prize in Literature. In the wake of this news, many in South Korea’s literary circles are once again asking themselves when a Korean author will claim the coveted prize. Since 1901 the Nobel Prize in Literature has been awarded to 111 Laureates, yet a Korean author has never collected the honor. In discussions with foreign publishers, Korean literary agent Joseph Lee discovered that Nobel Prize winning authors generally have two things in common: Usually, their works have been translated into at least 15-20 languages AND they have a “loyal readership in their own country.” Journalist Chung Ah-young has reported that over the last five years the average Korean spends only 26 minutes per day reading. How can Korea promote their literature to a global audience if they are having a hard time doing so at home? Fortunately, the quantity and quality of translations of Korean literature are improving every year, something which has often been a stumbling block in gaining more recognition and a larger readership from the global community. Ko Un (81) is frequently mentioned as a favorite for the Nobel Prize in Literature. So much so that reporters usually camp outside Ko’s home ahead of the yearly Nobel recipient announcement. Ko is a prolific poet and novelist whose career has spanned over five decades. His work has been influenced by the traumas which he experienced during the Korean War, his involvement with the Democracy Movement of the 1970’s and early 80’s, as well as by the ten years which he spent living as a Buddhist monk before he began writing in earnest. Almost every article I read on South Korea’s prospects of receiving a Nobel Prize in Literature mentioned Ko Un, yet I had never heard of him and his work before last week. Moreover, I didn’t know any of the other Korean writers who are also considered to be strong contenders for the Literature Prize, authors such as Hwang Sok-yong and Lee Seung-u. 2008 Nobel Laureate Jean-Marie Gustave Le Clézio has mentioned both Hwang and Lee as possible future recipients of the Nobel Literature Prize. After learning about who South Korea’s most esteemed authors are, I had a strong desire to investigate their work. My Korean language study has now progressed to a point where reading Korean books without translation can realistically be used as a learning tool rather than as an exercise in frustration and dictionary hopping. I am not yet at a stage where I can pick up any book and read it from front to back without a translator, but I am certainly able to read for pleasure with occasional rest stops for clarification and meaning. is to be a wolf under a corpulent full moon. As I delved further into Ko’s poems, it occurred to me that I could kill two birds with one stone by using them to study for the TOPIK II Korean Language exam, which I hope to take in the Spring of 2015. On account of Flowers of a Moment’s slim size, I believe that it is ideally suited for translation practice and because I write poetry myself, I feel that the translation work will hold my interest for the duration of the project. This morning I began with the volume’s first four poems. At this rate, I expect the translation to be completed by the end of December. In 2006 a translation of Flowers of a Moment by Young-moo Kim was published by BOA Editions Ltd. For me, the exciting aspect of this translation project is that an English translation already exists. You see, I am not a translator by trade. I don’t have a degree in Korean Language or a certification that would qualify me to do this kind of work professionally. Yes, I did pass the Basic Level Korean Language Exam, but so have many other language hobbyists who share my interest in Korean. After I finish my work, I plan to compare it with the BOA edition in order to see if the essence of my translation is truthful. I will be curious to examine how my work holds up, if it does at all. I am still learning Korean and translation is not an exact science, therefore if my version of Flowers of a Moment falls short of being a passable translation, I won’t judge myself too harshly. During this journey, I may occasionally post a snippet of whatever poem I happen to be working on at the time. In January, when the work is finished, I will update the blog with an analysis of the project. For now I leave you with the first poem from Flowers of a Moment. When I visit a cookware store, I am usually drawn to the large deep serving bowls. I am writing of the voluminous ones that could easily hold three pounds of cookie dough or enough pasta to feed the entire Chinese army. I am especially fond of bowls with a Provençal flair that are hand painted with colorful and intricate designs. If I really like a bowl, I will sometimes run an index finger around the outer rim of the vessel while thinking of the promise of its emptiness. Doesn’t emptiness imply a lack of something? Isn’t emptiness just the same thing as nothingness? On the contrary, while nothingness is a permanent state, emptiness is merely temporary. I believe that delicious possibilities can emerge through emptiness. When a serving bowl is empty after a satisfying repast, I don’t think about the fact that the meal has ended. Instead, I try to envision how and with what I am going to refill the bowl. I am confident that it can be refilled, yet I acknowledge that it may not always be easy for me to put dinner on the table. I may have to travel far and wide to find a unique ingredient and at other times I may have to stay at home all day to tend the stew. Either way, it will be my hard work that fills that bowl because it certainly will not fill itself. Sometimes I’ve been fortunate enough to have allies who have helped me stir the pot, but there have been many times when I’ve been the sole person in the kitchen. I frequently share the fruits of my culinary endeavors with others; I find that the echoes of laughter and human fellowship ringing off of a spacious bowl can fill it with something of far greater value than the more tangible sustenance sitting inside of it. It is in these moments of nectarous conviviality over a warm meal that I have deeply understood the promise that lies within a large empty bowl which sits on a store shelf, waiting for someone to give it a home. 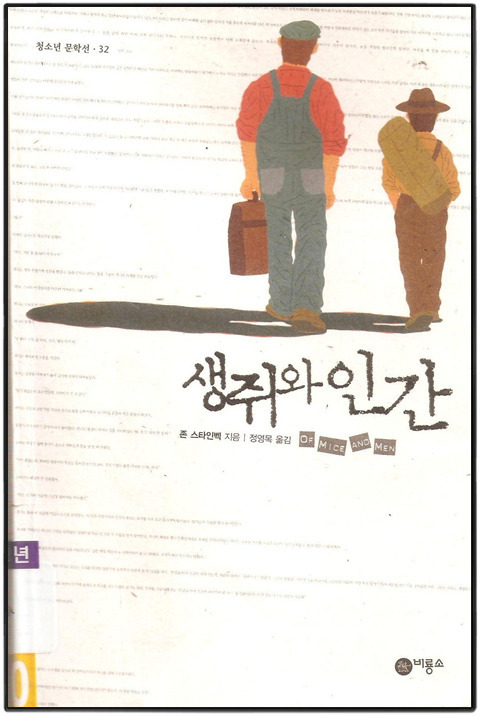 As a means of preparing for the 중급한국어능력시험 (Intermediate Korean Language Test), I am reading 생쥐와 인간, which is the Korean translation of John Steinbeck’s classic novella Of Mice and Men. I find that reading a translation of a book that one has already read in one’s native language is an excellent way to build vocabulary and to solidify grammar concepts without having to analyze the characters or the plot on a deep level since presumably you already did that when you approached it in your mother tongue. I think that the Korean translation is quite accessible for the intermediate Korean learner. A lot of the vocabulary and grammar are what one would find on the 초급시험 (basic level test), yet there is a sufficient amount of unfamiliar vocabulary too, which makes it a great study tool! I have always been drawn to Of Mice and Men because of its universal themes of loneliness and friendship as well as Steinbeck’s clean yet masterful narrative. Over the years it has often been my go to book when I have needed to spend time with an old literary friend, and I thought that there was nothing new that I could learn from reading it again. Then I hit the top of p.13 in the Korean translation and found myself reading the following sentence over and over again. Simple minded Lennie can’t remember why he and George were run out of Weed or where they were headed when they stopped to rest at the river. He can’t recall that George had both work cards from Murray and Ready’s or even that they received the work cards in the first place. Lennie can’t remember that the “lady” who used to give him mice to play with was his own Aunt Clara. But, there is one thing that Lennie can remember – the dream of raising rabbits on a small farm with George, a dream which the two men often wax sentimental about. It appears as if Lennie only remembers that which makes him happy. Now, I don’t believe that my life would be better if I had an inability to remember negative experiences which precluded me from making good choices, but as I re-read the text, I felt that I could learn something valuable from Lennie. When I reflect on an unfavorable interaction or experience that did not pan out the way that I had hoped, it is tempting to dwell on only the bad aspects of them. Or, when I consider my future, I tend to focus on forthcoming struggles and how burdensome they will be. Wouldn’t it be better if I could take a step back and remember what makes me happy and then focus on the things which bring a smile to my face? After all, worry and fear are only transitory states that we can certainly pass through if we allow ourselves to remove the albatrosses which weigh on us. Sometimes, I think we could all benefit from being just a little bit of a Lennie, don’t you? Coloring books are only for kids, right!? Wrong! 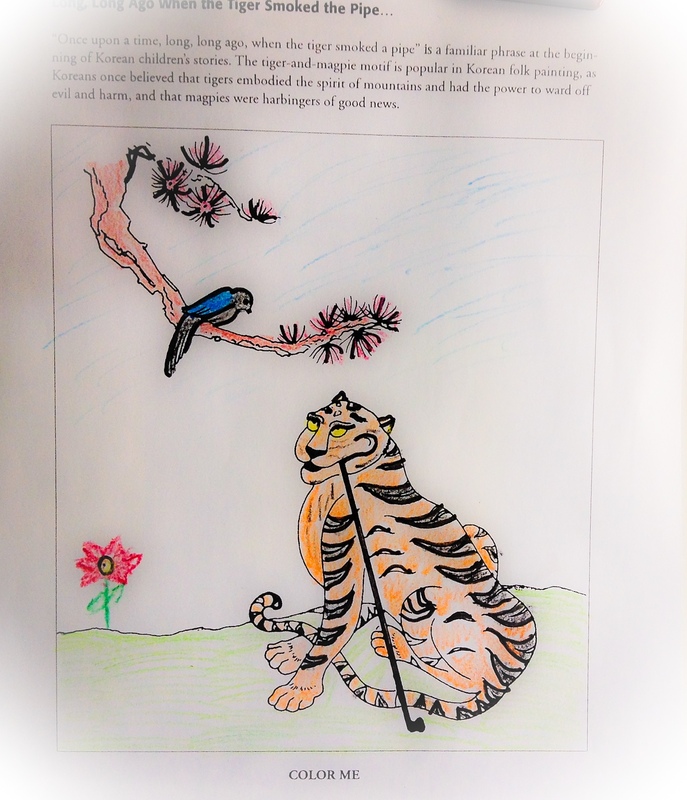 This morning, I accidentally stumbled upon the fascinating world of coloring books for adults while surfing the net for information on the Korean idiom 담배를 피우는 호랑이/a pipe smoking tiger. I became curious about the idiom after my husband’s students referenced it in regards to an unexpected and brief sun shower that we experienced yesterday. The students explained that the occurrence of a sun shower is as rare and as strange as the sight of a smoking tiger, therefore it is a fitting expression to use when we witness something that takes us by surprise and that is difficult to believe. I thought it was both a curious expression and a delightful mental image, so I logged onto the net to do a little investigating. After inputting a few appropriate keywords, I was directed to a 21-page student oriented pdf document about Korean Myths and Folktales that had been prepared by the San Francisco Asian Art Museum. On page 19 of the pdf document there was a short explanation of the smoking tiger idiom. and that magpies were harbingers of good news. If Korea’s smoking tiger is analogous to once upon a time in a land far far away, then it only makes sense that one might use it to describe something that could seemingly only emerge out of a fairy tale. 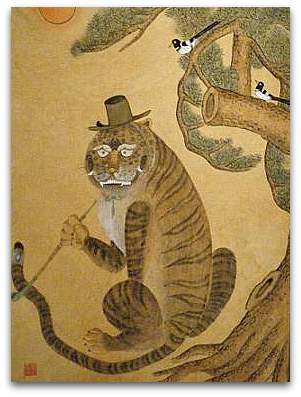 Beneath the above quoted passage lay an attractive coloring page that depicted a smoking tiger and a magpie of the kind that are commonly found in Korean folk paintings. At the bottom of the page in capital and bold black letters was the directive, COLOR ME. It was such a striking image that I really couldn’t help myself and as I teach children between the ages of three and nine years old, I always have crayons and markers at my disposal. So, while I should have been prepping for my afternoon lesson, I grabbed a set of crayons and went to work. I haven’t put crayon to coloring book in ages – let’s say 10 years or more. As I meticulously filled in the page I found myself becoming more relaxed; I even found myself smiling. And like a five year old, when I was finished, I proudly affixed my “masterpiece” to the refrigerator door with a magnet. Maybe it is a bit ridiculous for an adult to find a little Zen in the pages of a coloring book, but I truly enjoyed the experience and became curious about what kinds of coloring books were out there for adults. After doing a little web searching, I found a bevy of beautiful books that are best suited for older children and adults. From the Fauvism of Matisse to the mathematically inspired M.C. Escher to decorative tile designs and Celtic knotwork, there is something out there for just about everyone. These books are also often educational in nature as they usually contain information on the images contained inside. So, why not have a coloring party? Get a bottle of wine and some good food, invite a few friends over, and break out the crayons. At the end of the party, you can hang everyone’s finished work in a makeshift “gallery”and play art-critic. Don’t want to make coloring the theme of the party? You could just put a coloring book or two on a side table and leave it at that. At the very least, they might make an interesting conversation topic. Need a unique gift for a special occasion? For the right friend, a coloring book and crayon set just might be the ticket. Sure, it won’t be up everyone’s alley, but I bet you can think of at least one person who would appreciate such a gift. Go ahead! Give yourself permission to take just a little time out of your day to play and draw as you did when you were young. You don’t even have to stay in the lines!